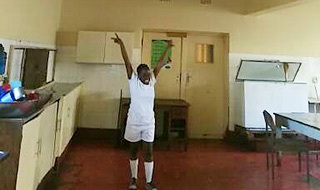 Blessing Chirimbani worked with her family to refurbish St Joseph's Home for Boys in Zimbabwe. In doing so, she aimed to improve the living conditions and quality of life of the young boys living at St Joseph’s. St Joseph’s Home for Boys provides care and shelter for Zimbabwean boys from the age of 3 to 19. It is a government funded initiative, but its upkeep has been neglected for years. As the home is located in Blessing’s hometown, she has been aware of its condition for some time, and wanted to use GoMAD funding to finally do something about it. Blessing identified the most effective ways to use her GoMAD funding to improve the home and benefit those living in it. She aimed to split the funding between renovation costs as well as school supplies and toiletries for the boys at St. Joseph’s Home. Blessing and her family worked hard to improve the kitchen at St Joseph’s Home. They worked for days to refurbish the property, and even received help from some of the boys living there. She was pleased to have been able to benefit the boys in the home by improving their living conditions. She aimed to fix the roof in the sleeping quarters, patch up holes in the walls throughout the property to prevent pest infestations, install a new stove in the kitchen and repaint the entire home. During the project, she also delivered school supplies to help the educational pursuits of the boys, as well as toiletries to help improve their hygiene. Throughout the project, Blessing encountered some challenges, which she overcame to benefit her personal growth. Staff members at St Joseph’s opposed the direction of her project and had other ideas for the refurbishment. However, Blessing stood her ground kept her project on track. Helping to refurbish St Joseph’s Home not only provided her with valuable leadership experience but also gave her a sense of accomplishment and fulfilment in being able to better the lives of children from her hometown. The project resulted in a great impact in the refurbishment of the kitchen and the wellbeing of the children from an angle that they hadn’t experienced before. I am grateful the GOMAD program and the beautiful people behind who saw the potential in me.